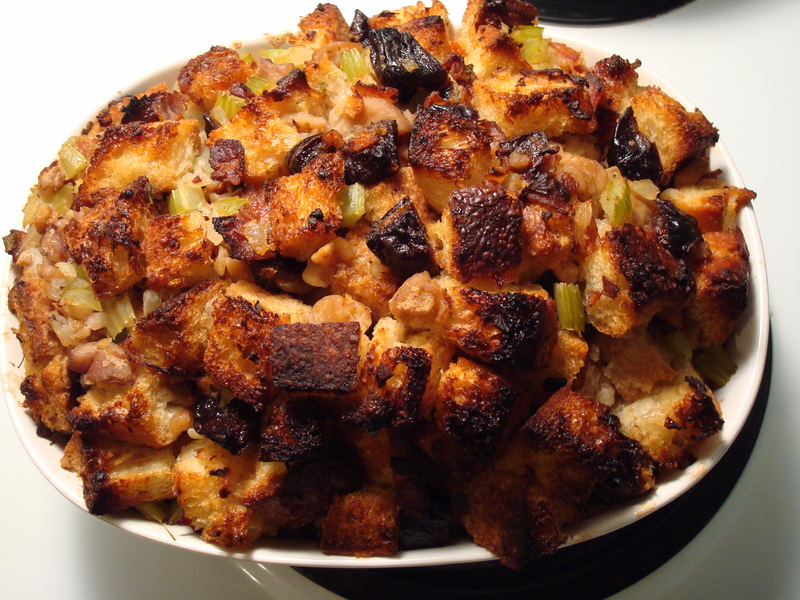 I used to be more of purist when it came to stuffing and always made the traditional kind with breadcrumbs, onions, celery, sage, etc. and then I branched out and did a cornbread version. 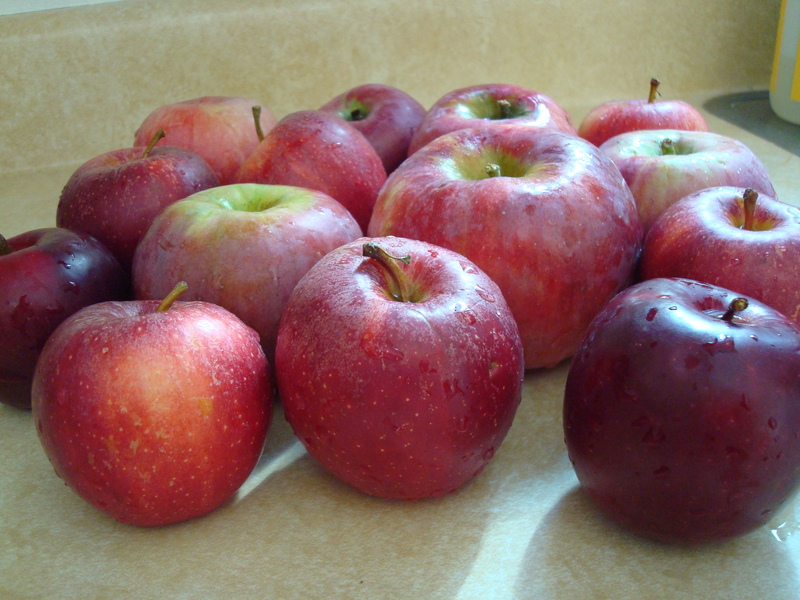 Last year I got real crazy and added sausage, apples, and dried currants. Somebody stop me! If you’ve been a reader of Baxter and Main for even a short while you have probably noticed my affinity for all things bacon so when I saw a recipe for stuffing with pancetta (which is essentially Italian bacon) I could not pass it up. The fact that it also included chestnuts which is an ingredient I have only begun to experiment with was just icing on the cake. 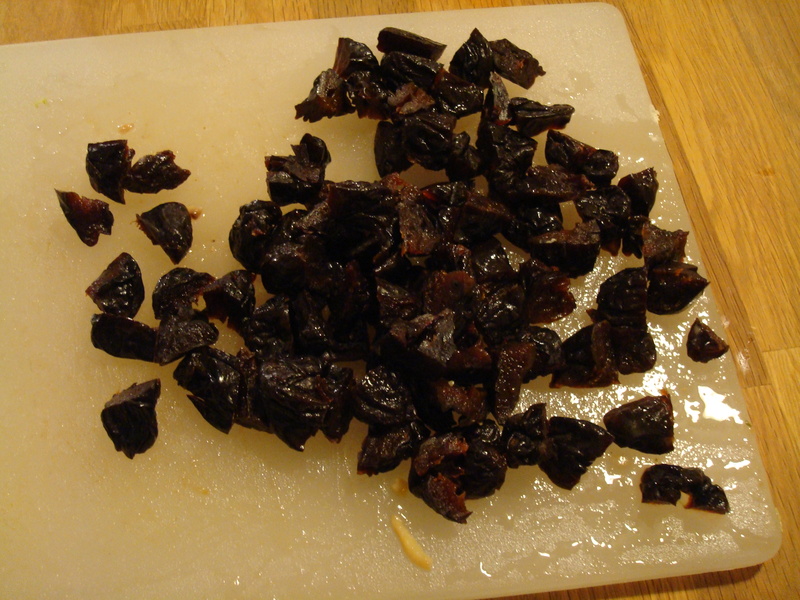 The recipe called for canned chestnuts which were not so easy to find in Madison, Wisconsin. I tried three different grocery stores before winding up at the LARGEST grocery store I have ever seen in my life (it rivals a suburban Wal-Mart in square footage with maybe a Kmart thrown in for good measure) where I spent a good half hour seeking them out. Would they be near canned vegetables? No. With nuts? Naw. In the ethnic food section? Nope, weren’t there either. Turns out they get shelved next to the canned pie filling. Wha-wha-what? Yeah, that’s what I said. 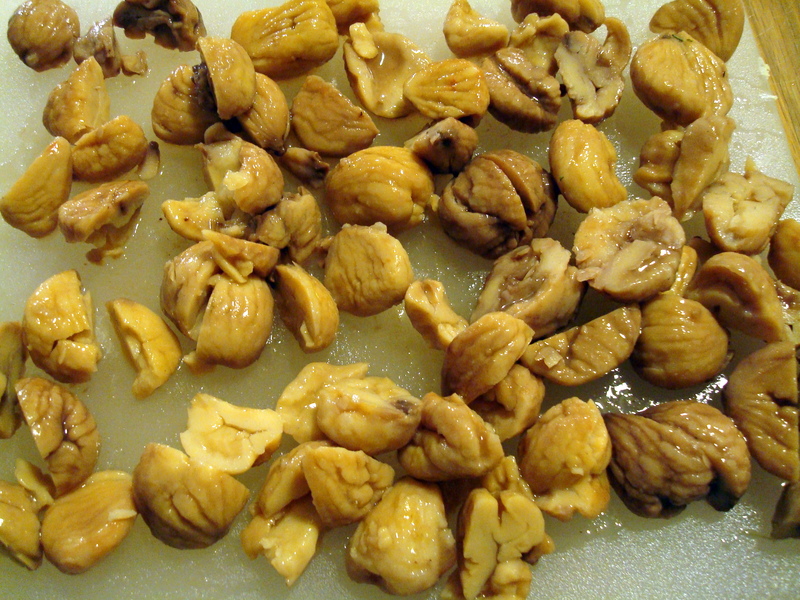 However, the long search for the canned chestnuts was well worth it as the stuffing was delish. A very strong contender for this year’s Thanksgiving meal, indeed. Put oven rack in upper third of oven and preheat oven to 400°F. Scatter bread in a single layer in 2 large shallow baking pans (17 by 12 inches) and toast, stirring once or twice and switching position of pans halfway through baking, until golden and dry, about 15 minutes. Transfer to a very large bowl. 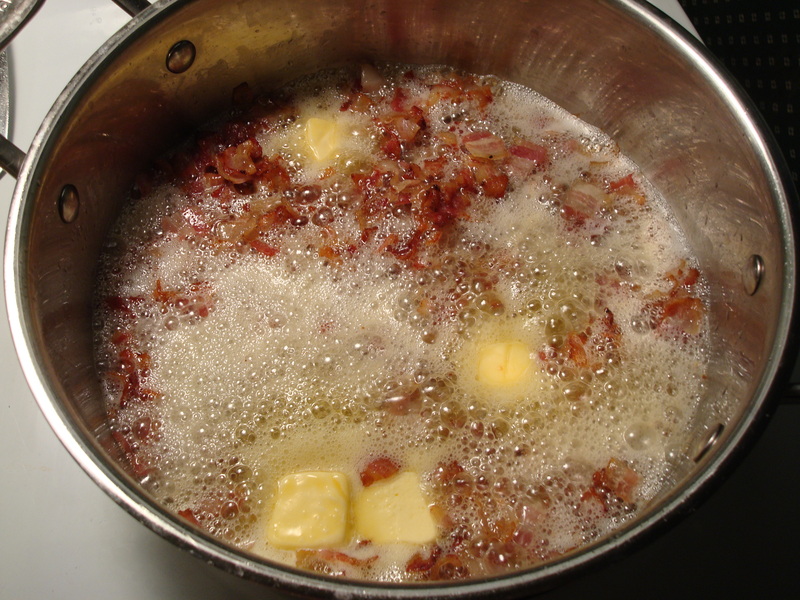 Cook pancetta in a 12-inch heavy skillet over moderate heat, stirring occasionally, until browned, 12 to 15 minutes. 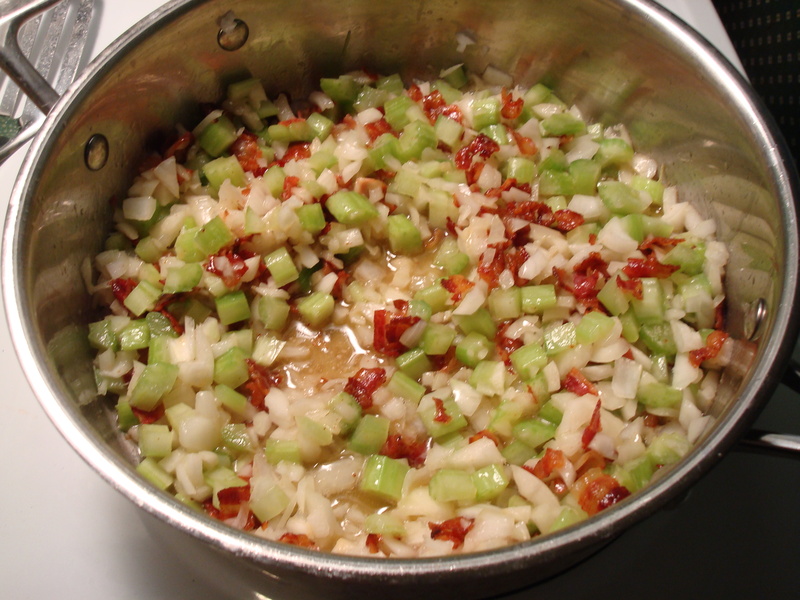 Add butter and heat until melted, then add celery and onions and cook, stirring occasionally, until softened, about 12 minutes. 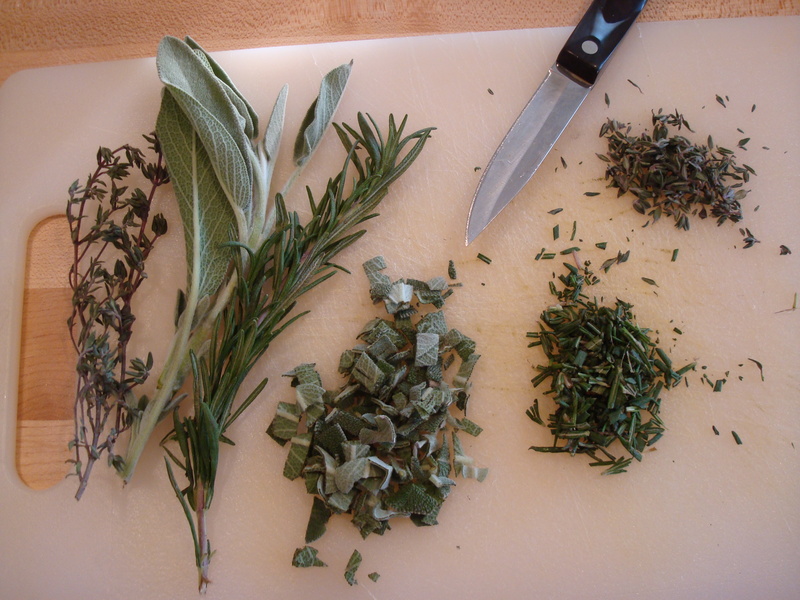 Stir in sage, salt, and pepper and cook 1 minute. Add pancetta mixture along with chestnuts and prunes to bowl containing bread. Whisk together stock and eggs, then stir into bread mixture until combined well. Transfer to baking dish (stuffing will mound above dish). Bake, loosely covered with a buttered sheet of foil (buttered side down) 30 minutes, then remove foil and bake until top is browned, 10 to 15 minutes more. 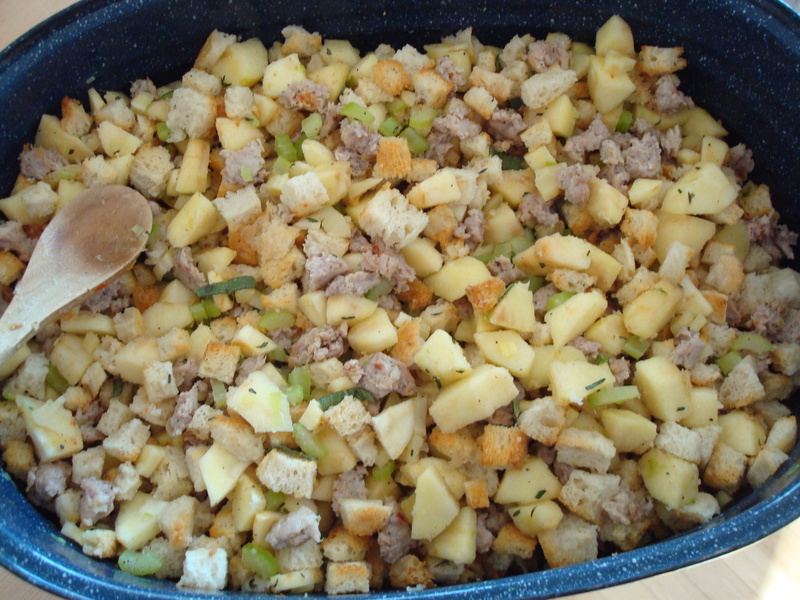 •Stuffing, without stock-and-egg mixture, can be assembled (but not baked) 1 day ahead and chilled, covered. Stir in stock mixture, then proceed with recipe. 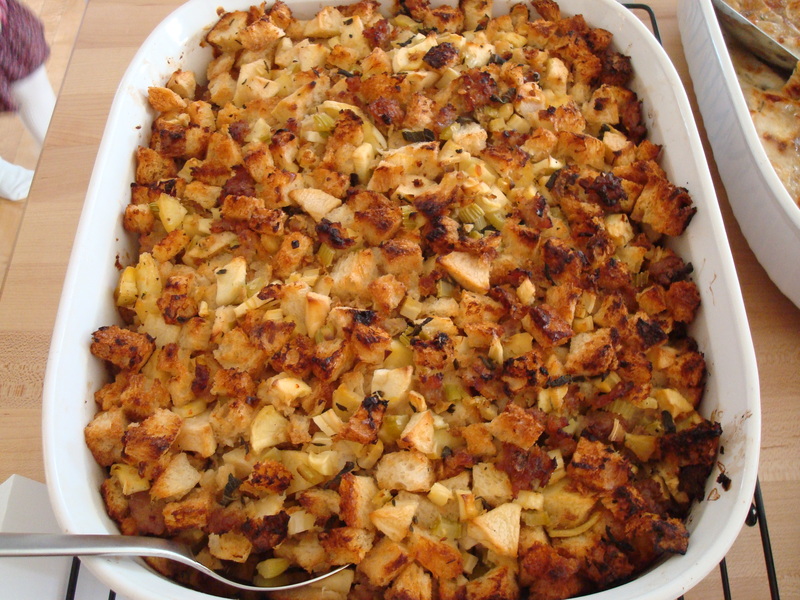 •Stuffing can be baked 6 hours ahead and cooled completely, uncovered, then chilled, loosely covered. Reheat, covered, in a preheated 400°F oven until hot, about 30 minutes.